//    cert.CertificatePKCS12 is a byte with the certificate. NOTE: This issue does not happen locally (Windows 7/Casini). Turns out there's a setting in the IIS Application Pool configuration (Application Pools > Advanced Settings) to load the user profile for the application pool identity user. When set to false, the key containers aren't accessible. This will cause IIS (which runs as the ASP.NET user which likely doesn't have access to a user store) to use the Machine store. This page explains the constructor in more detail, and this page explains the X509KeyStorageFlags enumeration. Additionally, if you have access, you may want to try changing your Application Pool setting to use LocalService (and then restart the AppPool). This may elevate your permissions to an appropriate level if that is the problem. Finally, you can use File.WriteAllBytes to write out the CertificatePKCS12 contents to a pfx file and see if you can manually import it using the certificate console under MMC (you can delete after successful import; this is just to test). It could be that your data is getting munged, or the password is incorrect. To be able really solve your problem and not just guess, what can it be, one need be able to reproduce your problem. If you can't provide test PFX file which have the same problem you have to examine the problem yourself. The first important question is: are the origin of the exception "An internal error occurred" in the private key part of the PKCS12 or in the public part of the certificate itself? It could help to verify whether the origin of your problem is the private key or some properties of the certificate. CertUtil.exe -dump -v -privatekey -p SomePassword "My.pfx"
(you can use some other options too) and post some parts of the output (for example properties of the private key without the PRIVATEKEYBLOB itself). 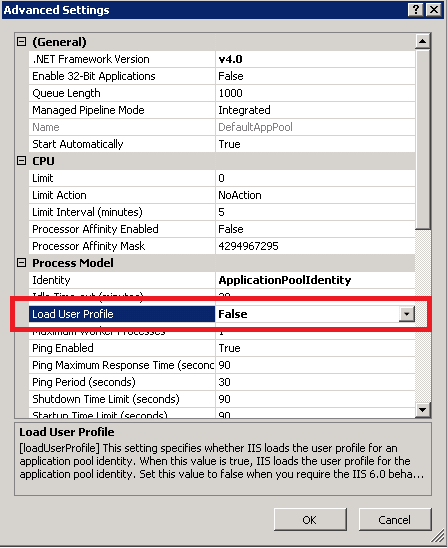 An alternative to changing the Load User Profile is to make the Application Pool use the Network Service Identity. See also What exactly happens when I set LoadUserProfile of IIS pool? You need to import a .cer certificate to your local machine keystore. There's no need to import your .p12 cert - instead use the second certyficate issued to your account by Apple. I think it must be a valid pair of certificates (one in filesystem, second in keystore). You'll have to set all 3 flags in dll of course. Not the answer you're looking for? Browse other questions tagged c# .net x509certificate or ask your own question. CryptographicException: Access denied - How to give access on User store?